The Southern New Hampshire housing market displayed steady growth this year and when compared to the Massachusetts housing market it had a stronger year. For this report, we are examining the three counties that make up Southern New Hampshire: Hillsborough, Rockingham, and Cheshire; and we are focusing on three property types: single family homes, condominiums, and multi-family homes. Sales for the whole year were up just above 5.14%, with 14,035 homes sold this year compared to 13,349 homes sold in 2016. The 2016 report exhibited more than twice the increase in sales over 2015, but 2017’s progress is still positive considering the low inventory. Condos and multi-families increased by 11.07% and 12.24% respectively, with condos moving from 3,235 sales in 2016 to 3,593 this year and multi-families increased to 642 from 572. Single-families increased by only 2.7%, with 9,800 sold this year compared to 9,542 last year. 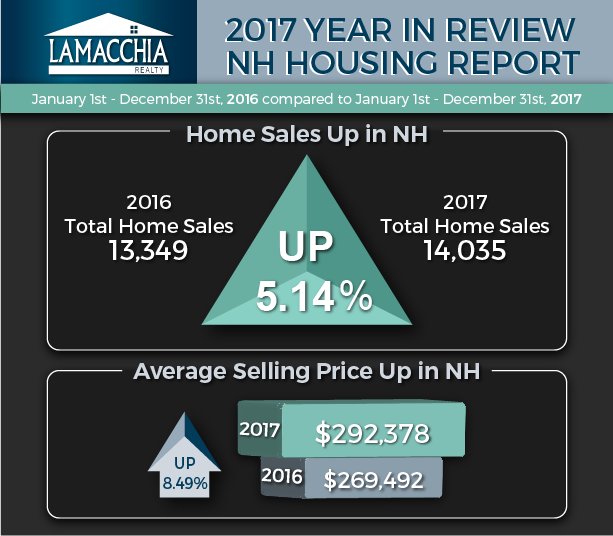 Average sale price came in much higher than last year in Southern New Hampshire, at 8.49%, from $269,492 to $292,378. Last year was essentially a flat line with an increase of a negligible .1%. Condos exhibited the largest increase in price, from $223,406 to $247,068; single-families came in under that at a 9.02% increase (from $287,530 to $313,464); and multi-families increased moderately, at 3.59% (from $285,104 to $295,327). There were only 3 months in 2017 that were higher in sales than their 2016 counterparts. February, March, and April were lower than last year, but only by an average of 3.8%. The rest of the year showed increases over 2016, with July and November as stand out months with double-digit increases of 13.28% and 15.65% respectively. Average home sale prices remained steady throughout 2017 with every month up over 2016. The first four months of the year showed the strongest change in January and February up over 13%, March up 17.25% and with April up almost 22.5%! The rest of the year’s performance was more moderate, but September and November were also strong months, both up at an average of 10.7%. 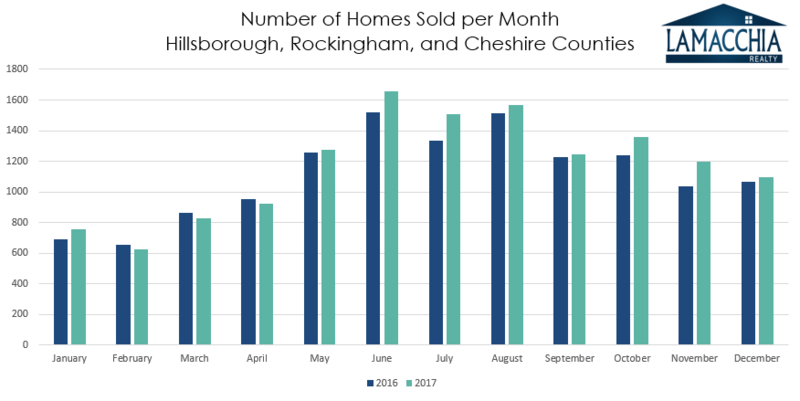 In last year’s Southern New Hampshire report we noted the upward trend of home sales in the three counties we examine – Hillsborough, Rockingham, and Cheshire since 2011. 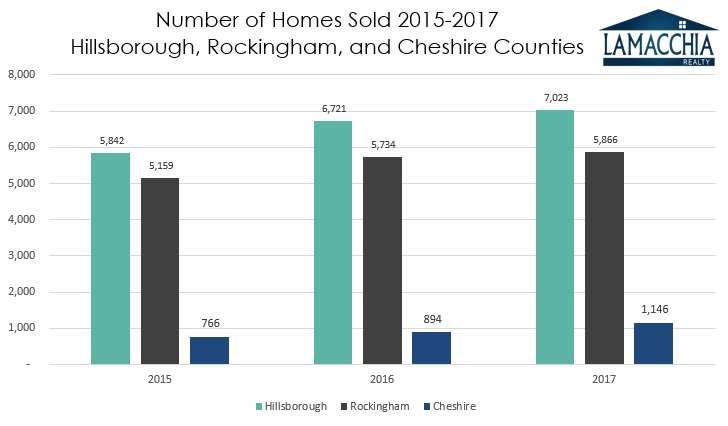 This year saw the continuation of this trend, with home sales in Hillsborough up 4.49% over 2016 to 7,023, Rockingham up 2.3% to 5,866, and Cheshire up 28.19% to 1,146. 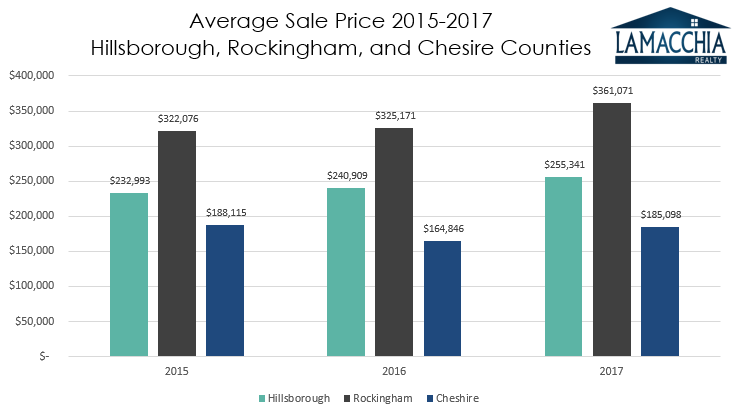 All three counties increased in prices this year, last year Cheshire county was down. Hillsborough increased almost 6% to $255,341, Rockingham increased 11% to $361,071, and Cheshire increased 12.29% to $185,098. Last year we predicted that prices in Southern New Hampshire would increase and that they did. We are likely to see a similar turnout in 2018, with sales and prices continuing to increase. To learn more about Anthony’s predictions for 2018, click here. *Data provided by Warren Group.